Above: Dancers from various pueblos and tribes, including Hopi from Arizona (pictured), perform at the IPCC on weekend afternoons. ON A BUSTLING BLOCK in Albuquerque’s North Valley, the Indian Pueblo Cultural Center stands as a beacon of Native New Mexico. Owned collectively by the state’s 19 pueblos, the center’s event calendar thrums with twice-weekly dance performances, cooking demonstrations, and traditional-healing talks. The exceptional Shumakolowa Native Arts exposes shoppers to new Native artists. The Pueblo Harvest Cafe consistently earns acclaim for its blend of heritage and contemporary Native flavors, and its weekend Party on the Patio is one of the most happening happy hours in town. 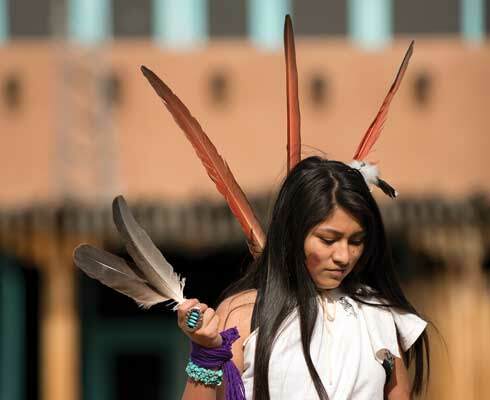 At 40 years old, IPCC remains the only such facility in the U.S. owned and operated by a group of sovereign nations, a place where visitors can learn about Pueblo culture from the people living it. This is particularly evident in a new exhibit unveiled this month, We Are of This Place: The Pueblo Story, the first major renovation of the permanent exhibit since the center’s opening four decades ago. Importantly, the center functions as a starting point for people who want to embark on further explorations of Native culture, providing context and insight before they tour and attend ceremonies and feast days around the state. 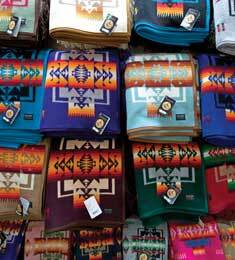 Clockwise from top left: Pendleton blankets at Shumakolowa Native Arts. 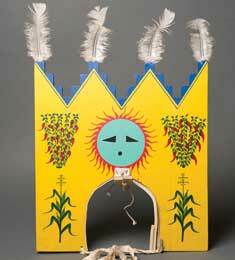 On exhibit, a tablita, or headdress, worn by female corn dancers at Jemez Pueblo. Hopi dancers. The IPCC shines by night. 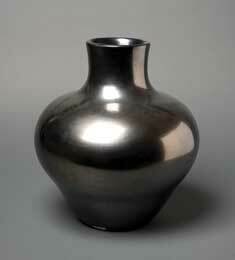 Gunmetal-gray jar, made by Maria Martinez of San Ildefonso and fired by her son Popovi Da, 1964. 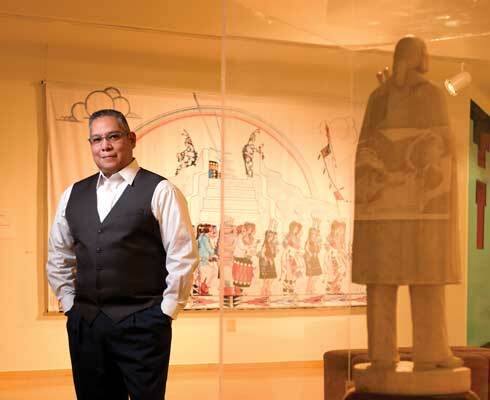 Statue of Po’pay in the IPCC museum entrance lobby, by Cliff Fragua of Jemez Pueblo. The lobby was designed to resemble a kiva. THE INDIAN PUEBLO Cultural Center sits on land once part of the Albuquerque Indian School, a boarding institute founded in the 1880s with the ethos of “Kill the Indian to save the man.” As with other federal Indian schools of the time, the facility aimed to assimilate Native people into the mainstream—depriving them of their families, heritage, and cultural identities. Over the decades, the school’s militaristic policies softened, and it became a place where high school students could learn farming and Pueblo art techniques, and form fond memories and social bonds. In the 1970s, due to changing civil rights tides and funding issues, the school was slowly dismantled; the student body was shipped north to the Santa Fe Indian School. All but one of the buildings were razed; that original structure now houses a charter school. The Bureau of Indian Affairs transferred the vacant acreage at 12th Street and I-40 to the All Indian Pueblo Council, a consortium of the state’s tribal governors. That the federal government turned over lands to the tribal federation was significant, but what the council aimed to do with those lands was more so: to preserve and protect Pueblo culture at the very location where so many had sought to destroy it. The IPCC opened on August 28, 1976, featuring a D-shaped building that echoes the form of Pueblo Bonito at Chaco Culture National Historical Park. The structure’s aperture has become a dynamic space where traditional dance is performed, and over the decades, famed artists such as Jose Rey Toledo (Jemez) and Pablita Velarde (Santa Clara) have embellished its walls with some of the center’s now 19 murals. Inside, the permanent exhibit Our Land, Our Culture, Our Story related Pueblo history to Native and non-Native people alike for nearly 40 years. 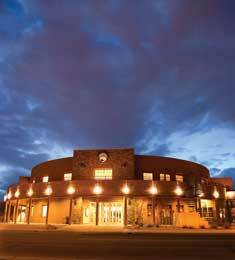 Like a living pueblo, the center has expanded over the decades, adding meeting rooms in 2004 and expanding and refreshing its restaurant and gift shop in 2008 and 2010, respectively. 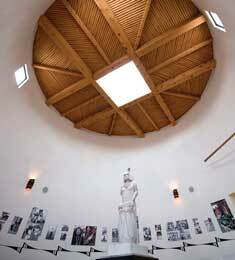 Pueblo Harvest Cafe and Shumakolowa Native Arts are integral to the center’s longevity. Recognizing that it couldn’t draw upon already financially strapped pueblo communities to establish the nonprofit center, the AIPC established a for-profit arm at the outset to operate a center for business in the neighborhood. Indian Pueblos Marketing Inc. operates the convenience store on the west side of 12th Street for the benefit of the IPCC. On the east side, the corporation operates two office buildings, a hotel, and the first Native-owned Starbucks in the country, which made national news when the coffee shop opened in December 2015. Because the state’s 19 pueblos collectively own the land and the corporation, the businesses’ profits also benefit them. These successful enterprises are helping to fund the next phase of the IPCC’s history. Travis Suazo, executive director of the IPCC. AS WITH ITS FOR-PROFIT arm, the nonprofit IPCC has diversified, becoming a destination for more than placard reading. Yet amid its otherwise lively offerings, the center’s mainstay exhibit remained untouched until a couple of years ago, when designers began fashioning a thematic journey through Pueblo culture to appeal to today’s touch-screen visitors. Whereas many histories start with European contact, for Pueblo people the stories begin far before that. The section also relates collective Puebloan values—shared original instructions from the Creator to respect one another and all living things. From there, the exhibit unfolds into sections that highlight commonalities and distinctions among the pueblos. Gifts of the Creator explores farming, wildlife, the art of pottery, adobe construction, and dance—projecting recorded buffalo and butterfly dances on the wall. In Traditional Teachings, the arts of moccasin and drum making, along with language, are at the fore. Here visitors can select a pueblo from an interactive map and hear a traditional greeting in Zuni, Keres, Tewa, Tiwa, and Towa. In a section devoted to storytelling, visitors can listen to Puebloans tell about why coyotes howl and why rivers never run straight. In the next area, “Perseverance,” freestanding displays pair descriptions of struggles—from the Spanish entrada and Catholicism to the Pueblo Revolt and the boarding experience—with stories of people adapting and overcoming. “Pueblo people are strong. We have a voice. All of this is who we are. We’re not a stereotype. ... We have similar values, but different art and cultures,” says Operations Director Monique Fragua, who has overseen the renovation. 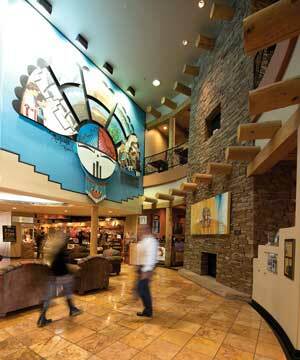 The IPCC’s handsome lobby, a gateway to Native New Mexico. WE ARE OF THIS PLACE: THE PUEBLO STORY opens to the public on Saturday, April 2, during normal museum hours: daily, 9 a.m.–5 p.m. This month’s edition of the IPCC’s monthly lecture series, The Counter-Narrative, will touch upon the first two decades of the center’s history. The free event An Indian Pueblo Cultural Center Retrospective: The First 20 Years will be held Wednesday, April 20, from 5:30 to 7 p.m. 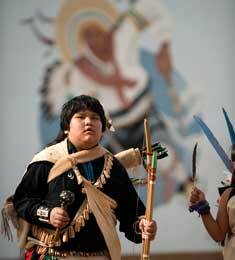 The IPCC also presents a special 40th-anniversary edition of American Indian Week, April 25–May 1. The week includes the Spring Indian Arts Market, four traditional dances each day—including the Fontenelle Family Dancers, who danced at the IPCC’s grand opening in 1976—fresh fry bread, and the first appearance of Miss Indian World after her crowning at the Gathering of Nations Powwow. The summer camp for adults is slated for June 6–10. Camps may guide participants through the center’s collection vaults, inviting them to handle (with gloves on) thousand-year-old pottery shards, attend a talk in the community garden about pueblo farming methods, or help them learn how to buy authentic Native-made jewelry. Registration information is available at indianpueblo.org. In 1977, the Friends of the Indian Pueblo Cultural Center took on an ambitious campaign to raise money for the painting of murals at the center. Most were painted in 1977–78; the last was painted in 2010. Guided tours of the 19 murals are available every Friday at 1 p.m.
Groups present traditional dances in the courtyard every Saturday and Sunday at noon— and more frequently during select times of the year, such as American Indian Week and Albuquerque International Balloon Fiesta. Party on the Patio happens Fridays and Saturdays from 6 to 9 p.m.